Phillipa Boyens, well known for her collaboration with Peter Jackson and Fran Walsh on The Lord Of The Rings and The Hobbit franchises, has signed on to help Disney kickstart a new fantasy franchise – this time based on T. A. Barron’s The Merlin Saga books, about the early life of the wizard of Arthurian legend. With something of a void to fill in the fantasy series realm after years of hobbits and young wizards (Warcraft is on deck, along with some new Harry Potter films, but our journey in Middle-earth is done, and even YA post-apocalyptic franchises are reaching their conclusions), Disney is hoping to launch a new title, and Barron has already created a wide setting (spanning 12 books) that could take the legend closer to a Harry Potter audience, and Boyens, who shared the 2002 Oscar with Jackson and Walsh for The Return Of The King, could be perfect for leading a expansive vision on screen. Gil Netter (Life of Pi) is producing. No director has been named yet. The project was previously set up at Warner Bros where it seemed to be making progress, but after a couple years of silence it moved to Disney last year. 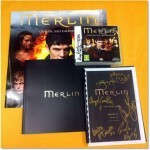 Another new Merlin episode preview, another giveaway! On Friday’s episode, “The Diamond of the Day, Part 1”, Morgana and Mordred prepare to destroy Camelot, while Morgana plots to destroy Emrys. Is Merlin Camelot’s last hope? Find out Friday at 10/9c on Syfy. And also check out star Colin Morgan’s recap of last week’s episode! Best part – you don’t have to fill out any forms, give any personal information, or anything like that – you just need to tweet! Retweet this sneak peek, or tweet a link to this page with the tags @scifistorm, #Syfy & #DiamondoftheDay (you need all three to be counted), OR you can tweet @scifistorm and @MerlinOfficial about last season’s finale – the one that you can win the script for! It’s as easy as that! If we get enough tweets, one of you will win the prize pack! So watch, tweet, and win! Deadline is Sunday! You can already watch the first four minutes of Monday’s Defiance online here, but here is this weeks “Shooting the Shtako”, plus an interview with Grant Bowler and Julie Benz, and a clip behind the scenes of the VFX from last week’s episode. Merlin preview: “The Drawing of the Dark” and another giveaway! Here’s a preview for tomorrow night’s episode of Merlin, and another chance at a giveaway with some cool items, including an actual prop map of Camelot! To get chance to win, watch the preview below, then tweet out this article to your followers, including the tags #Syfy and #DrawingoftheDark. You can also tweet us with those tags, and tell us what your favorite Syfy moment or moments have been! Merlin returns tonight to finish out the series! Here is a sneak peek of the episode, and tune in at 10/9c on Syfy to watch! King Uther returns! This was rumored months ago when it was believed Merlin‘s Anthony Stewart Head was on the set of Warehouse 13, and fueled by a picture from star Eddie McClintock having dinner with him, fellow star Saul Rubinek, and Head’s fellow Buffy the Vampire Slayer alum James Marsters, but it’s been confirmed – Head will appear in the final three episodes of Season “4.5”, reportedly as a villain named Paracelsus.